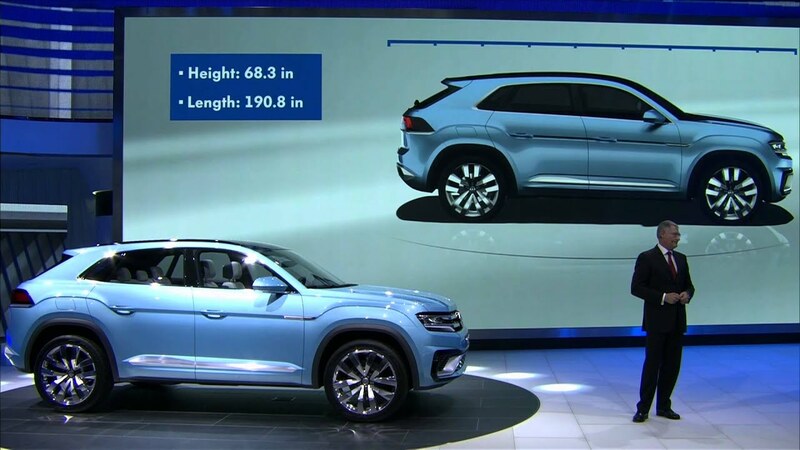 Volkswagen has unveiled a new five-seater midsize SUV concept car at the North American International Auto Show in Detroit. Called the Cross Coupé GTE, it is a plug-in hybrid with all-wheel drive, and previews Volkswagen’s new US design language, combining German engineering with the American way of life. The new car’s debut at the show, which runs from 12-25 January, comes ahead of the start of production at the end of 2016 of a new seven-seater midsize SUV at Volkswagen of America’s Chattanooga factory in Tennessee. The Cross Coupé GTE is the third concept car presented by Volkswagen in the run-up to the introduction of the production version. Together, all three concept cars – the CrossBlue presented in Detroit in January 2013, the CrossBlue Coupé most recently shown in Los Angeles in November 2013 and the Cross Coupé GTE that is now being presented at the NAIAS – represent just a part of the wide spectrum of SUV variants that can be realised through the modular transverse matrix (MQB), and were developed with the aim of offering an SUV in North America in the near future that is consistently tailored to the US market. In E-Mode, activated at the press of a button, the Cross Coupé GTE can travel in zero-emission mode for up to 20 miles or 32 km*, and in this case the 85 kW rear axle electric motor alone drives the vehicle, with the V6 FSI decoupled from the drivetrain by disengaging the clutch and shutting down. But as soon as the six-cylinder engine needs to be restarted due to the battery charge status or other parameters, it engages smoothly in the drivetrain again in a fraction of a second. The Cross Coupé GTE also has a number of different driving profiles: Onroad (with the sub-modes Comfort and Eco), Offroad (with Rocks, Sludge & Sand and Gravel), Sport and Snow, and each of these changes the set-up and driving characteristics of the car. Needless to say, the Offroad drive mode is particularly important for an SUV and all four wheels are powered as soon as the driver activates this mode. If Offroad is engaged and the battery state of charge is low, the front electric motor is employed exclusively as a generator that is driven by the V6 FSI in order to provide the power for its counterpart on the rear axle. As the power to drive the rear axle flows by wire and not mechanically, it is referred to as an ‘electric cardan shaft’. Due to the fact that the FSI drives the rear electric motor via the front electric motor in off-road mode, all-wheel drive is available even when the battery has a low state of charge. The design of the cockpit reflects the car’s hi tech engine and drivetrain nature, featuring horizontal lines and clear digital controls with intuitive operation. The new infotainment system is controlled via a 10.1-inch touchscreen, while a 12.3-inch Active Info Display – similar to that recently previewed on the new Passat – allows extremely high-quality interactive graphic presentation of all details in the digital dashboard. The Cross Coupé GTE features sports seats at the front and a three seat bench in the rear, which can be folded 1/3 or 2/3, creating a continuous flat cargo floor. *due to different type approval procedures the electric ranges for the USA and Europe cannot be compared on a 1:1 basis.